Lymph nodes in the neck can become painful for a variety of reasons, including infectious and noninfectious. Read more below to learn about associated symptoms, possible causes, and treatment options for painful lymph nodes in the neck. The lymphatic system is an import network of organs, vessels, and glands throughout the body important for immune function. The glands of the system, called lymph nodes, function to filter and trap viruses, bacteria and other pathogens before they can spread and infect other parts of the body. They play an important role in your body's ability to fight infection and often swell in the setting of inflammatory conditions. The neck has multiple lymph nodes (cervical lymph nodes) that can become painful due to a variety of conditions. 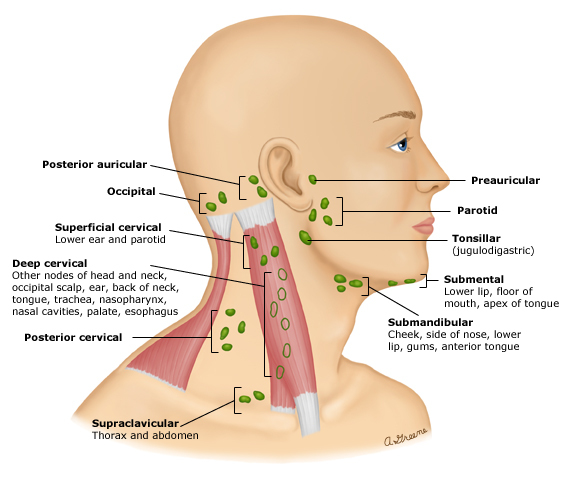 See this image for a visual representation of the multiple lymph nodes within the neck area and lower face. Neck pain along the lymph nodes is usually a sign of an underlying condition, so it is important to follow-up with a healthcare professional promptly. Neck pain along the lymph nodes can be caused by enlargement of the lymph nodes (lymphadenopathy) or inflammation of the lymph nodes (lymphadenitis) . Traditionally, infectious etiologies are the main cause of lymphadenitis. Noninfectious etiologies are usually the main cause of lymphadenopathy; however, there can be overlap. Acute causes of lymphadenitis develop over a couple of days and can be very noticeable. These conditions are usually followed-up more promptly than chronic conditions that take time to develop. However, it is important to take note of any symptoms of pain and associated symptoms over time in order to get proper care. Infectious causes of neck pain along the lymph nodes can be acute (developing over a few days) or chronic (developing over weeks or months) and can happen on both sides of the neck (bilaterally) or on one side (unilateral). Acute: Acute infectious causes are often those related to viral or bacterial pathogens. Many upper respiratory viruses such as adenovirus, influenza virus and enterovirus often cause lymphadenitis and associated symptoms such as a cough, congestion, and sore throat. Streptococcus is a bacterial infection that can cause pharyngitis and lymphadenitis that is often very tender. Chronic: Chronic infectious causes are most often related to viral infections such as Epstein-Barr virus (EBV) and more serious viral infections such as HIV. There are also less common bacterial pathogens that can cause lymphadenitis such as tuberculosis. Noninfectious causes of neck pain along the lymph nodes can occur similarly as above, acutely or chronically and bilaterally or unilaterally. Acute: Acute noninfectious causes of lymphadenopathy or lymphadenitis are inflammatory conditions that are not associated withinfection. In children, illnesses such as Kawasaki disease is a type of vasculitis (inflammation of the blood vessels) that occurs in childhood . A characteristic manifestation of this condition is lymphadenopathy. Chronic: Many noninfectious chronic causes of neck pain along the lymph nodes are associated with cancerous processes. For example, cancers of the lymphatic system, called lymphomas, can occur in many different types. Lymphomas often occur in the lymph nodes of the neck and can grow very rapidly, causing massive swelling, and are associated with symptoms of fatigue, night sweats, and unintentional weight loss. The list below shows results from the use of our quiz by Buoy users who experienced neck pain along the lymph nodes. This list does not constitute medical advice and may not accurately represent what you have. Myofascial pain syndrome is also called chronic myofascial pain (CMP.) Pressure on certain points of the muscles causes referred pain, meaning the pain is felt elsewhere in the body. The cause is believed to be muscle injury through overuse, either from sports or from a job requiring repetitive motion. Tension, stress, and poor posture can also cause habitual tightening of the muscles, a form of overuse. This overuse causes scar tissue, or adhesions, to form in the muscles. These points are known as trigger points, since they trigger pain at any stimulus. Symptoms include deep, aching muscular pain that does not go away with rest or massage, but may actually worsen. There is often difficulty sleeping due to pain. Myofascial pain syndrome should be seen by a medical provider, since it can develop into a similar but more severe condition called fibromyalgia. Diagnosis is made through physical examination and applying mild pressure to locate the trigger points. Treatment involves physical therapy, pain medications, and trigger point injections. In some cases, acupuncture and antidepressants are helpful. Retropharyngeal abscess is a collection of pus in the tissues in the back of the throat. It is a potentially life-threatening medical condition. There are lymph nodes behind the ear. Lymph nodes are where your immune cells live, and when they become enlarged, it could be from a nearby infection, immune response, or even backlog of blood. Treatment for neck pain along the lymph nodes will depend on the specific cause. Your healthcare provider may make the following suggestions/treatments in the setting of neck swelling. Antibiotics: If your symptoms are due to a bacterial cause, your physician will prescribe the appropriate antibiotics. Supportive care: Many causes of enlarged lymph nodes may be viral in nature. Viral causes will not resolve with antibiotics, and your physician will most likely suggest supportive remedies, such as resting or pain relief if that is the case. Cancer treatment: Lymphoma treatment may involve chemotherapy, immunotherapy medications, radiation therapy, a bone marrow transplant or some combination of these. Other cancer treatments involve similar treatment modalities as well. Here are some frequently asked questions about neck pain along the lymph nodes. What does it mean when the lymph nodes hurt? Painful lymph nodes are usually a sign of acute or chronic infection and sometimes noninfectious causes such as cancer or autoimmune disease. Lymph nodes function to filter and trap viruses, bacteria and other pathogens before they can spread and infect other parts of the body. Often pain and other associated symptoms are the first sign that an underlying infection or process is occurring. Why do the lymph nodes become painful due to these different causes? The pathophysiology of cervical lymphadenitis (inflammation of the lymph nodes) is not completely understood; however, it is thought that it is in relation to the penetration of the microorganisms into the skin of the neck that are transported by lymph vessels to the lymph nodes . How long will the pain along my lymph nodes last? The duration of the pain will depend on the root cause. For example, painful and swollen lymph nodes due to infectious causes often resolve once the illness resolves. With causes that are related to the cancerous or chronic processes, the resolution is often dependent on a specific treatment. Lymphomas can be divided into different types. The most common categorizations are Non-Hodgkin Lymphoma vs. Hodgkin lymphoma. Hodgkin lymphomas can often spread very quickly and the signs and associated symptoms, such as night sweats or weight loss, can be very severe . Does lymphoma go into remission? According to Lymphoma-action.org, lymphoma will never relapse in most people after successful treatment. The goal of treatment, especially for low-grade lymphomas, is remission. If you have a good remission, you are likely to have a longer time before your lymphoma relapses. Understand your neck bump symptoms with Buoy, including 9 causes and common questions concerning your neck bump.